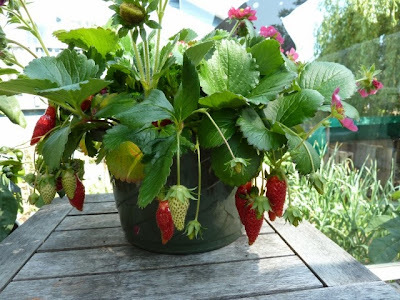 Look at how many strawberries are on the pretty plant with the pink flowers. I have decided to transplant it later in the season into a large pretty pot so the berries can always hang like this. I love it. I love how they hang, and the shape of the berries...beautiful plant. It is a treasure. You know how every now and then you add a plant and WOW!!! And the berries are shaped like Christmas light bulbs! !